In un impiantatore ionico, la densità media delle molecole di degassamento lungo il percorso del fascio viene utilizzata come cifra di merito per valutare il progetto. Deve essere calcolata come funzione dell'angolo del wafer, che presenta una rotazione attorno a un asse. While the Microfluidics Module is used for modeling slip and continuum flows, the Molecular Flow Module is designed for accurately simulating flows in the free molecular flow regime. Historically, flows in this regime have been modeled by the direct simulation Monte Carlo (DSMC) method. This computes the trajectories of large numbers of randomized particles through the system, but introduces statistical noise into the modeling process. 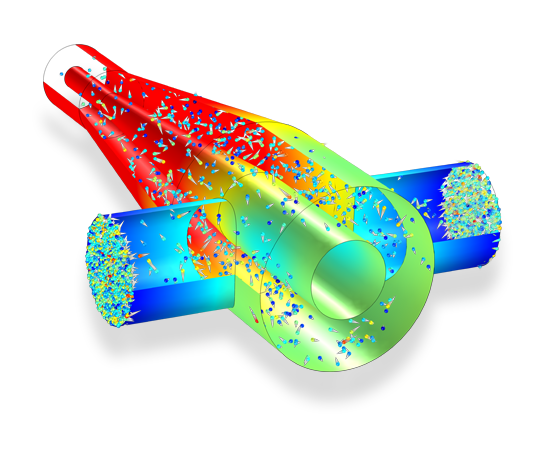 For low-velocity flows, such as those encountered in vacuum systems, the noise introduced by DSMC renders the simulations unfeasible. Probabilità di trasmissione tramite un accoppiatore RF, calcolata utilizzando il metodo del coefficiente angolare, disponibile nell'interfaccia Free Molecular Flow, e un metodo Monte Carlo, disponibile nell'interfaccia Tracciamento matematico di particelle (richiede il Particle Tracing Module). The Molecular Flow Module is designed to offer previously unavailable simulation capabilities for the accurate modeling of low-pressure gas flows in complex geometries. It is ideal for the simulation of vacuum systems, including those used in semiconductor processing, particle accelerators, and mass spectrometers. Small channel applications (e.g., shale gas exploration and flow in nanoporous materials) may also be addressed. The Molecular Flow Module uses the angular coefficient method to simulate steady-state free molecular flows, allowing the molecular flux, pressure, number density, and heat flux to be computed on surfaces. The number density can be reconstructed on domains, surfaces, edges, and points from the molecular flux on the surrounding surfaces. You can model isothermal and nonisothermal molecular flows and calculate the heat flux contribution from the gas molecules. This two chapter tutorial shows how to model an ion implantation system using the Molecular Flow interface available in the Microfluidics Module. Chapter 1 inlcudes steps: adding physics, building the model, and meshing. Chapter 1 includes steps: adding physics, building the model, and meshing. Learn more about this model here. This benchmark model computes the pressure in a system of outgassing pipes with a high aspect ratio. The results are compared with a 1D simulation and a Monte-Carlo simulation of the same system from the literature. This model computes the particle flux, number density and pressure on the surface of a plate that rotates in a highly directional molecular flow. The results obtained are compared with those from other, approximate, techniques for computing molecular flows. This model shows how to simulate the time-dependent adsorption and desorption of water in a vacuum system at low pressures. The water is introduced into the system when a gate valve to a load lock is opened and the subsequent migration and pumping of the water is modeled.